Rare bird's-eye view of Colby College, Waterville, Maine. This is a rare 1909 Richard Rummell view of Colby College, a private liberal arts school located in Waterville, Maine. The view illustrates the original campus, of which no buildings survive. The view centers on Memorial Hall, constructed in 1869 to memorialize the Colby men who died in the Civil War and the center of campus life. Prominently featured to the right of Memorial Hall, is Chemical Hall, the home of chemistry lectures and labs, the president's office, and a faculty meeting room. To the left is South College Hall, constructed in 1821, and the campus's first building in downtown Waterville. In the distance the distinctive dome of Shannon Observatory, built in 1889 to the specification of the distinguished physicist William Rogers, who Colby lured from Harvard. The Kennebec River Flows in the background. Rummell began issuing views of American colleges around 1905. Rummell's views come in several different forms including color, black and white, and as here sepia. Like most of Rummell's university views, it is copyrighted by his publisher, W. T. Littig and Company. In more recent times Arader Galleries has acquired many of the original printing plates for Rummell's college views and currently issues re-strikes, but the original early 20th century printings, as here have become extremely rare. This is the first 1909 printing. It was partially re-engraved and issued in color c. 1913. 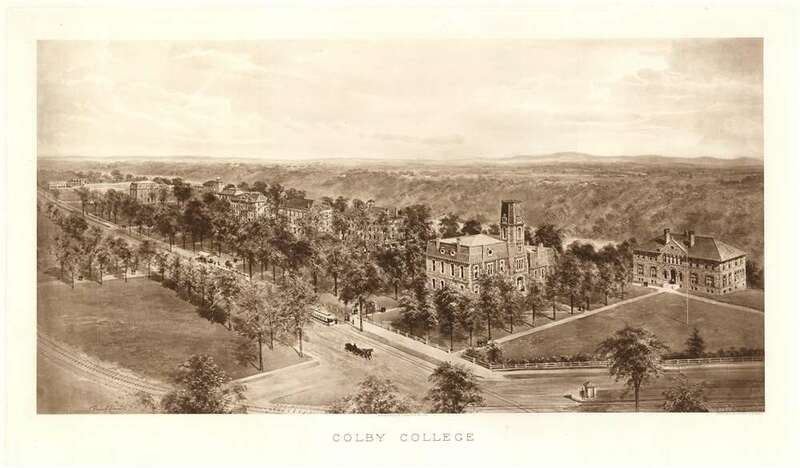 We have encountered many of Rummell's view over the years, but this is the first time we have seen an original of Colby College. Richard W. Rummell (1848 – June 4, 1924) was an American artist active in Brooklyn during the late 19th and early 20th century. Rummell was born in Canada, the son of german immigrant Frank X. Rummell and his wife Eliza Rummell. He immigrated to the United States as a youth settling with his parents in Buffalo. He relocated to Brooklyn when he was in his mid-30s, setting up an illustration office at 258 Broadway in Manhattan. Rummell is best known for his series of views of American colleges completed around the turn of the century. Since Rummell's views universally appear to be drawn from an altitude of about 300 feet, it has been speculated by many art historians that he worked from a balloon. Rummell was also a bit of a futurist and among his more interesting works are a series of speculative images of the New York of tomorrow, with vast airships, trains running over the tops of skyscrapers, and elegant sky bridges throughout. In the 1950s, the original printer's plates for many of Rummell's university views were rediscovered in a Brooklyn warehouse. They were auctioned and sold Arader Galleries, which today issues 'limited edition' reprints of his more desirable university views. Rummell's Brooklyn home was located at 45 Bay 28th Street and later 73 Hanson Place. In addition to his work as a visual artist, he was an accomplished actor and an avid yachtsman. He founding member of the Bensonhurst Yacht Club, where his yacht, the Careless was usually docked. He was also a member of the Royal Arcanum fraternal order. Rummell was survived by his wife, Emmeline Rummell, daughter, Chrissie Atkinson, and two sons, John Tribel Rummell, and Richard Rummell Jr., who became a famous Florida architect.